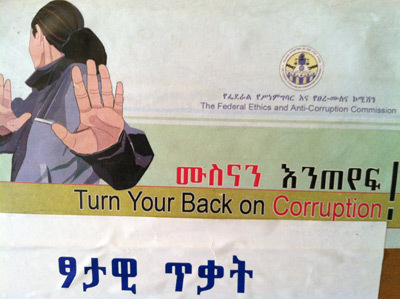 Hari Mulukutla joi ntly facilitated a round table discussion on income and assets declaration systems for the Federal Ethics and Anti-Corruption Commission (FEACC) and Regional Ethics & Anti-corruption Commission (REACC) Officials in Debrezeit Ethiopia from Nov 17-19 2013. 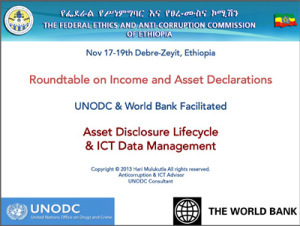 The program was organized by UNODC and supported by the World Bank. A number of key topics were covered in the 3 day program including fundamental issues involving ethics disclosures for public officials such as achieving submission compliance, conducting verification of filings, collecting supporting documentation, investigation of false filings, advantages and challenges of public access of disclosures and electronic filing systems using IT databases.